The Color Splash team embarks on their most ambitious makeover yet, when they take on a disastrous living room. All the original furniture in the room was destroyed when the homeowners' pipes burst, but host David Bromstad and his team work hard to give them a brand new and much better replacement! Taking cues from their southwestern and woodsy-style accessories around the house, warm oranges, rust and reds form the background for this mountain lodge-style living room complete with wooden columns and stone facades. 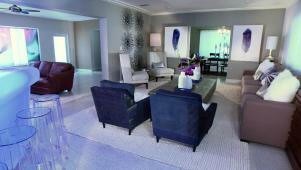 David Bromstad helps a couple rebuild their living room. This lodge-style living room is complete with wood columns and stone walls.